A downed power line is potentially hazardous. Always assume a fallen wire is "live" or "hot" even if it looks harmless. If the wire is energized or "live," it will electrically charge anything that comes into contact with it. Never touch anything the fallen wire has been in contact with. Stay clear, warn others around you to keep away and call the local utility company immediately. If someone is harmed by an outdoor wire, call an ambulance, notify the police or fire department, and call the local utility company immediately. Stay away from the wire and the person who was hurt. Do not touch them because they can still conduct electricity through you. 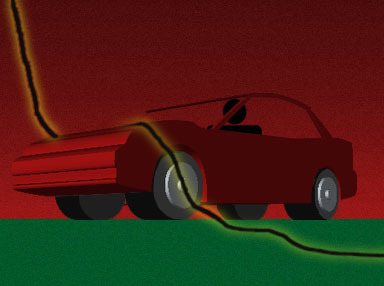 If you see someone in a car with a fallen power line contacting it, do not approach the car and try to help the person out. If you touch the car, you complete the path for the electricity to flow into the ground through your body. Instead, tell the person to stay in the car and remain calm, and that you will contact and alert the necessary emergency people. If you're inside a car and a live wire comes in contact with your vehicle, stay inside where you are safe and wait for help. The tires of the car provide insulation between the car and ground, and should protect you against electrical shock while you remain inside the vehicle. 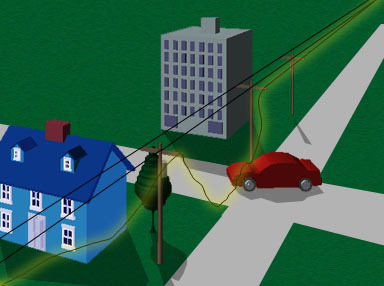 If you touch the vehicle and the ground at the same time, you will complete the path for electricity to flow between the downed wire and the ground, right through your body. If you must get out, a method that can work well is to stand on the edge of the inside of the vehicle and leap as far from the car as possible onto the ground.